Thanks for helping make our 30th birthday our best festival yet! We can’t wait to see you again next year! A giant called Viktor, a herd of woodland creatures and a choir of heavenly voices summoned the final moments of the main festival program. 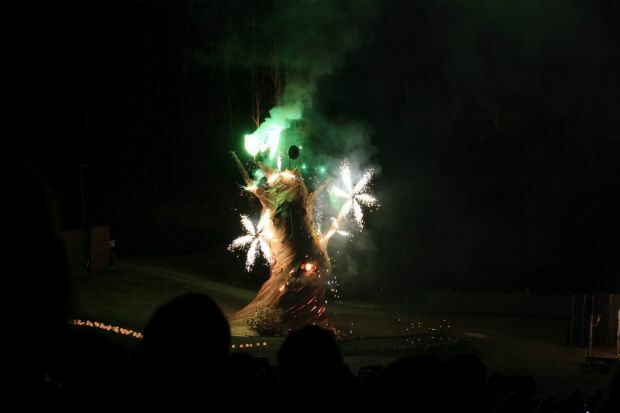 In a stunning display that incorporated the work of thousands of hours of lantern-making by patrons and volunteers, the crowd in the Amphi was again mesmerised by the magic of Woodfordia. Sending a message of sustainability, hope, and oneness with nature, the final show captured the values festival director Bill Hauritz holds dear. “Everything we do at the festival must fall under the guidelines of our 500 year plan … If it doesn’t, we don’t do it,” Mr Hauritz said in his director’s report. The event brings almost to a close a record-breaking festival, seeing more than 120,000 people pass through the gates in six days, with a handful of gigs still to be played overnight. Thanks for following along with our live coverage of the festival. We’ve loved every minute of it and we hope you’ve enjoyed it too. 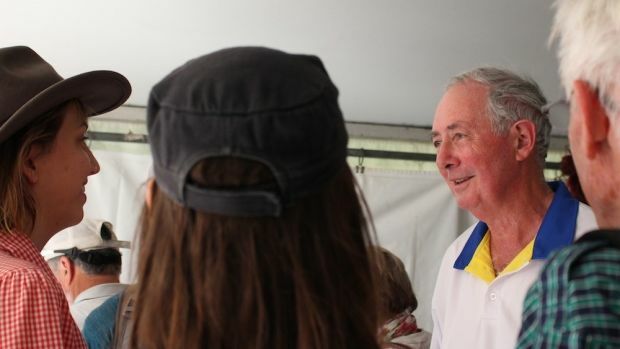 Woodfordia is set to become an independent “notion” state, with passports, national service, and embassies in place of tickets, volunteers and sponsors. The vision of festival director Bill Hauritz was laid out in the director’s report, referred to by one patron as the “Woodfordia State of the Union address”. Mr Hauritz said wet weather could affect revenue by as much as 12 per cent and season camping regulars were the most valued of all patrons. Daniel Champagne’s music was the beginning of a love story for two festival goers. The Australian guitar extraordinaire was approached by a girl following his set at the Cygnet Folk Festival in Tasmania when he was only 18 years old. His song Nightingale had inspired the girl to tell her boyfriend she loved him. “I thought damn, she’s got a boyfriend,” Daniel joked to the Woodford crowd. A few years later the couple flew the musician to Tasmania to play at their wedding. Only six months ago Daniel received news the couple was expecting and planned to name the child after him. A loud “ahhhhh” rang out when Daniel shared the story with the Bluestown tent on Friday. Daniel is a regular favourite at Woodford for his loud hand slapping, fast finger tapping guitar skills replicating the sounds of an entire band. The sound of uproarious drumbeats is usually the first thing that draws people to the otherwise inconspicuous Three Worlds stall. 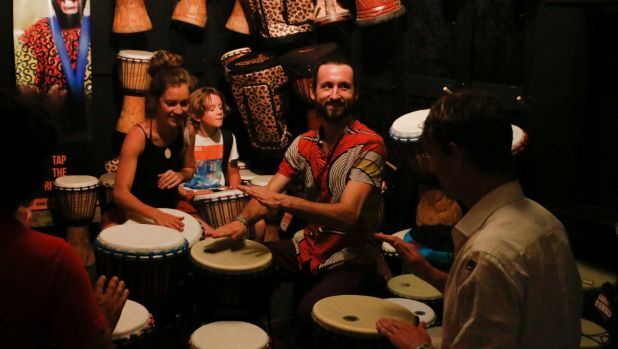 The drumming workshops offer enough excitement for some but others take an interest in the the array of tools for practicing fire juggling and fire spinning which the stall provides. James Arden is a fire spinner but also enjoys playing the bongo drums. He said novices, even those who played other sorts of drums before, might find it surprisingly tiring. “If you’ve come from playing a normal drum kit, playing bongos is a whole different ball game. It’s a great workout,” he said. 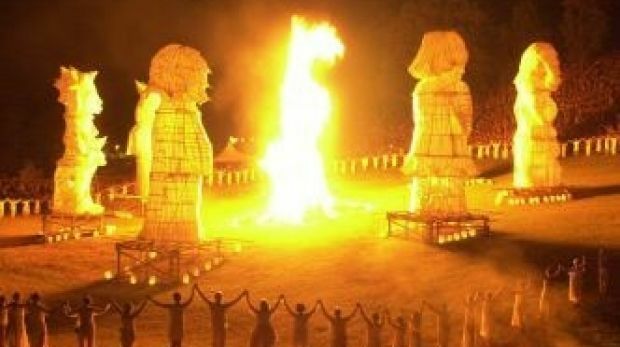 After six days of music, debate, art, comedy and commerce, Woodford is winding down for another year with the annual fire event and lantern parade. The show kicks off from 7.30 and winds its way behind the festival before a climactic end in the Amphi. Many of the rituals performed at the event will be carried over from previous years. The fire choir will sing the music they have been learning during the course of the festival and festival-goers’ dreams and wishes for the New Year written on pieces of paper will be burnt to symbolize renewed commitment to the future. After a huge night last night it’s understandable that some Woodfordians are feeling a little under the weather. Here are some hangover tips from fellow revellers. 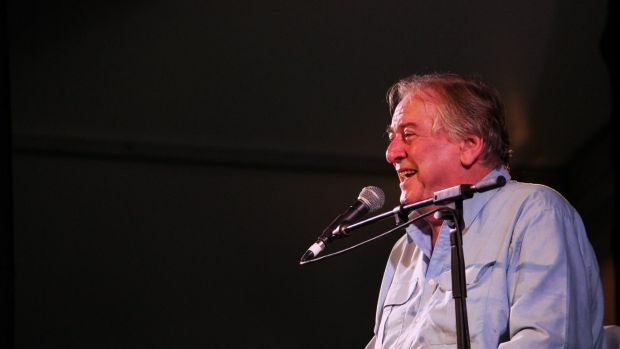 Respected environmentalist Professor Ian Lowe decided musicians shouldn’t be the only ones to sing at Woodford. Crowds joined the former president of the Australian Conservation Foundation to sing a song he wrote especially for Woodford. “Sustainability forever, that’s a future that is clever” was the chorus of the anthem that rounded off Lowe’s speech about economic growth in a sustainable future. “We need to see the economy as a means to an end to achieving social goals, not as an end in itself,” he said. When world-renowned musician Harry Manx thinks his rare guitar sounds even better since it was recovered in a social-media-inspired police sting. Manx is famous for his skill at playing multiple instruments including the Mohan veena, of which there were only a handful in the world. He was devastated when it was stolen at a Chicago airport. “It was like I’d lost an old friend,” he said..
After a post he made on Facebook about the lost instrument garnered more than five and a half million shares, the police launched a sting operation to capture the thief and as a result the 20-stringed Mohan veena was returned. “I think it sounds better since I got it back. I don’t know what he did to it,” Manx says. The musician, whose distinctive style combines Indian folk music with American Blues, said he didn’t stick to the conventions of either genre. “In that sense, I’m a really bad person. I misuse both styles. I break all the rules of Indian music,” he said.